A Well-Feathered Nest: Christmas is Coming! It will be here before we know it! I've had this printable I've been meaning to share with you all for quite some time. Things have been busy around here, but the real delay is that my laptop seems to be on its last leg. Thankfully, I sent my husband out one day for a new external hard drive, so I was able to get most everything backed up. (note to self: I must remember to run another backup tomorrow for those few most recent items. ) All that's to say that my computer time has been limited to emergency gift label printing for the most part lately. 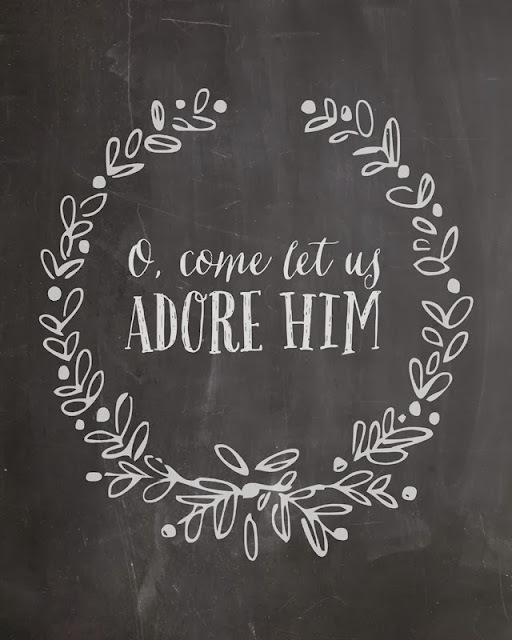 Maybe it's not too late for some of you to enjoy this Christmas chalkboard printable. Click the pic below to download the JPEG file. UPDATE! I'm still getting lots of emails about the image not downloading for people. Depending on your operating system and browser, it may work better if you right click and choose to open the link in a new tab or window. i LOVE this print!! but i can't get it to download. Oh no, Jill! I double-checked the link, and it seems to be working. I'm not sure what the issue may be. If you shoot me an email at awellfeatherednest at gmail, I'll send the JPEG straight to you. The link isn't working here either. I'll send an email. Thank you! Thank you so much for this gererous and BEAUTIFUL image. So appreciate your generosity! I emailed you today about this but I found it! Yay! I'm trying to get this to work for a landscape print for me though. Is there any chance you could help me with the chalkboard look for the background? Crystal, I came across this printable while I was looking for Christmas patterns to embroidery for a market I going to be in. Is there any ways I could buy the pattern off you that I could for commercial use? Thanks!